This section on Basic Theory is an introduction to those of you that have had little or no experience in music. You may see it as a chance to brush up on basic concepts or just get to know a little more about music theory. Firstly we take a look at all the elements that make up 'music'... notes, clefs, staves, rests, intervals, accidentals, time signatures, key signatures, etc., and then we look at how these elements interact and formulate. In any field of study there is information we need to learn and apply, certain rules we need to follow, and even formulas to help us along the way. Music theory helps us to understand the music, along with its elements, principles, applications, rules, formulas, etc., and once we understand the music, we are better prepared to create the music. We will start with the very basics. Pitch is how low or how high sound is placed. Sound is shown on the piano for example by keys. It is shown on music by printed characters called notes. Notes are given pitch position by being placed on 5 lines and in 4 places called a Staff or Stave. We will use Stave in the following as it is less confusing in the plural form. A clef is a sign placed at the beginning of every Stave of music to give definite pitch position and an alphabetical name to all the notes placed on the Stave. Without a Clef, we don't know what the note names are and how high or low the notes will sound. Bass Clef or F Clef - the F line (F3) passes between the 2 dots. The treble clef and bass clefs are the most commonly used clefs in modern music. MC stands for Middle C, the grandfather note. It is placed on the first ledger line above the bass clef or the 1st ledger line below the treble clef. (They are the same note) See C4 above. When you go from a given note name to another note of the same name, you pass through seven different names plus the repeated one. This is 8 notes in all and is called an Octave. Over the centuries little sayings have been invented to help us remember the notes on the Treble and Bass Clef. The first letter of each word represents the note. Treble Clef: The notes on the lines are E G B D F from bottom to top: Every Good Boy Deserves Fruit. Bass Clef: The notes on the lines are G B D F A from bottom to top: Good Boys Do Fine Always. The time signature indicates the relationship between timing counts and note symbols, while the bar lines group notes on the staff into measures. Bar lines are the short vertical lines drawn across the Stave at regular metrical beat intervals according to the counting given in the time signature. Bar Lines are used to separate measures. They are also extended to connect the upper and lower staffs of a grand staff. Double Bar Lines : Used to separate two sections of music. Also used at changes in key signature, time signature or major changes in style or tempo. Double Bold Bar Lines: Used to indicate the conclusion of a movement or an entire composition. Dotted Bar Lines : Used to subdivide long measures into shorter segments for ease of reading. When double bar lines have dots placed before them, it means that the section just played or sung is to be repeated. If the dots are placed after the double bars, the section ahead is to be repeated. In this example, the section between the dots is to be repeated... more on repeat signs. Bars are not always the same length by ruler-measurement, but each bar of a piece contains the same number of beat counts. This is shown by the time signature at the beginning of the piece. Download a free chart on all the lines in music, including bar lines. The length value of note sounds is indicated by the shape of the notes. This includes the note head, the stem, and the flags, hooks or beams. The shape of the head, and the absence or presence of the stems and flags, all indicate the duration of the note. A semibreve rest may be used for a whole bar rest at any time no matter how many beats are in each bar. (or hooks) as the rest has branches. P.S. Note value indicates the relative duration of a note, e.g., the duration of a quaver/eighth note is ½ beat; the duration of a semiquaver/sixteenth note is ¼ beat, etc. 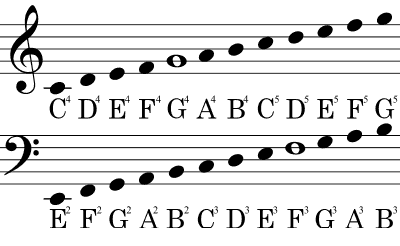 Dotted crotchet/quarter-note = 1 + ½ (1½)beats, dotted minim/half-note = 2 + 1 (3)beats, dotted quaver/eighth-note= ½ + ¼ (¾)beats. 2. A fermata, pause, or hold symbol placed above or below a note lengthens it for an indefinite period according to the performers' preference. 3. A tie is a curved line over 2 or more notes of the same alphabetical name or pitch. The first note is sounded and sustained until the values of all the notes end. In this example the note is held for 1 + ¼ beats. When notes are written from the lower part of the stave up to and on the third line, they usually have their stems placed on the right side of the note turning upwards with tails or flags down to the right. Notes written on the third line and above, usually have their stems placed on the left side of the note turning downwards with tails or flags up to the right. Notes which have tails may be grouped instead of being left single, e.g., the quaver family may all be grouped... quaver, semi-quaver. demi-semi-quaver etc. I hope you have enjoyed this session on Basic Theory. Keep working at it. Just remember that you have to crawl before you can walk. It's like everything in life. The more you do it, the more natural it becomes. Your confidence grows and grows and before you know it, you're an expert! Remember... Perseverance is GOLDEN.